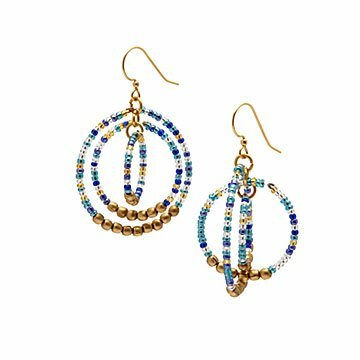 Women artisans in Nepal made these eye-catchingly elegant hoop earrings by hand of glass and brass beads. To us, the classic, circles-in-circles gyroscope design of these beaded earrings looks like a modern primitive sculpture in a museum exhibit. But they have more humble origins: over 200 women artisans in Nepal create them to earn a decent living. Handmade of dramatically contrasting glass and brass beads, their eye-catching hoops add simple elegance to both casual and dress-up outfits. Designed in the US. Handmade in Nepal. 1.5" Dia; Full Drop: 2"
These earrings are so pretty and distinctive. I got multiple compliments the first time I wore them, including from a stranger. They look much more expensive than their extremely reasonable price.